Ladies and Gentlemen we are proud to present you one absolute ultra rare find in our private collection, an Antique Edwardian Silk Wedding Dress Glass Beads. Offering a stunning champagne-toned antique wedding gown in a rare larger size, circa turn of the century. This dress is wearable and in sturdy antique condition. It is an antique dress, approximately 100 years old. I have listed some flaws and issues below. Despite these issues, this dress is in 95% perfect condition. This dress is gorgeous and ornate. 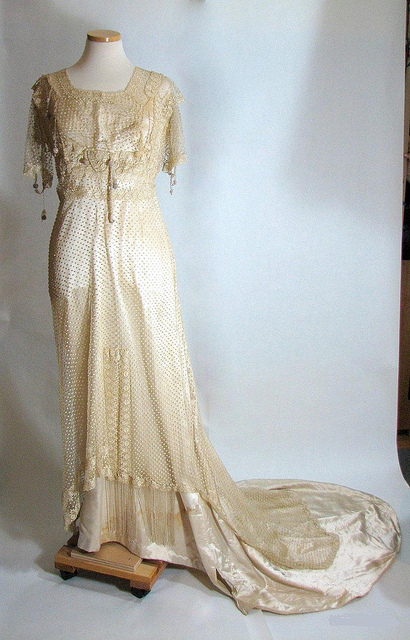 The bead work, lace and styling date this gown between 1910 and 1915. This gown is for a bride who is seeking a totally unique, delicate, and feminine antique wedding dress. This dress is completely hand-tailored. It has no label, and it is completely original and one of a kind. The seams are machine-stitched, but there is a huge amount of hand stitching throughout, and hand-rolled french seams throughout. 10 inch x 8 inches of Glass beading hangs down asymmetrically along the right front bottom. As with most clothing of this period, you will need a friend or assistant to dress, due to the incredible tailored fit with many closures. The bodice does up with a row of hook-and-eye closures along the spine. 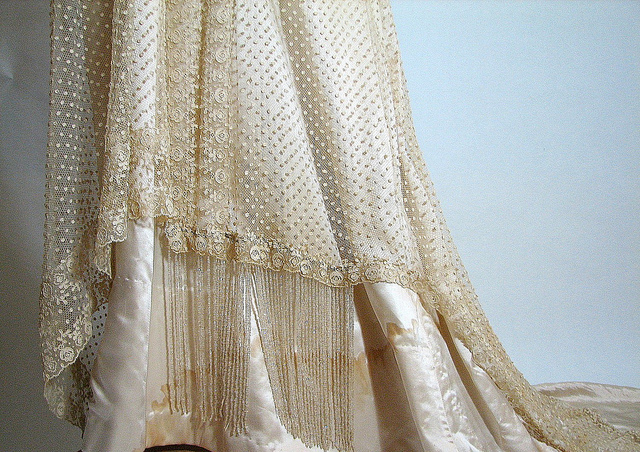 Below the waist, there are two sets of hook-and-eye closures (one for the silk bodice, one for the lace over layer). At the small of the back, one snap closure has come unsewn, and on the right lower back there is a tear in the lace. There is a small rip to the lace on the back hip. The bodice has some light boning for shape. The skirt has weights sewn into the hemline. 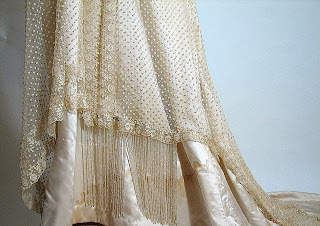 There are water marks around the hemline of the silk skirt. There is one stain on the right front side of the bust. These will likely come out with dry cleaning. We have not cleaned this gown. There is another set of closures to fit the hips, on the right hip, slightly askance to the spine seam. 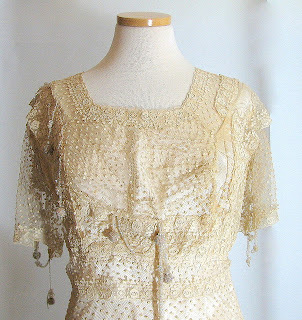 The sleeves are open at the top portion, affixed with three rows of beaded chains. The beads drape the bodice asymmetrically along the left side, in contrast to the asymmetrical beads along the right side bottom of the dress. Overall, much of the bead work is intact, but repairs will need to be done. Some of the bead work is unraveling, or has become unattached and is missing beads. This stunning antique wedding dress is in need of dry cleaning, and some careful repairs before it is ready to be worn. There are some flaws to the lace, silk and stitching throughout. If you have further questions, do not hesitate to contact us. We are more than happy to provide many more detailed photographs. Condition: Great condition. Guaranteed antique and authentic. Smells fresh. *sigh* Why am I not skinny AND wealthy? I don't think you'd want to wear this dress given how old it is. I'd just buy it and make a copy in my size. As for wealthy, that's what Lotto tickets are for!